It was only a few days ago that the BSF announced that they would hold a trial. 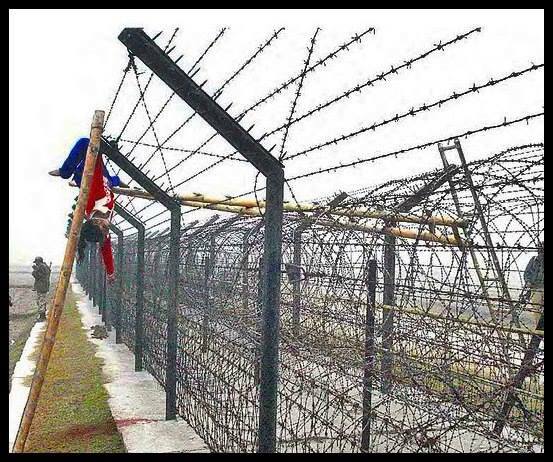 A trial of a murder committed on barbed wires defying conscience. A murder that made a nation cry and shamed another. Many rejoiced at the announcement that the family of Felani would get justice and that the people of Bangladesh would have the opportunity to sample some legendary Indian justice. Above all, a nation was eagerly waiting, looking for a gesture of goodwill which was more than mere words. As the judges read out their judgment, millions of heads on the other side of the fence crashed in shame that they had ever hoped for justice. Many listened to the news of the verdict with tears in their eyes. The special BSF court in India’s Cooch Bihar on Friday acquitted Indian border guard Amiya Ghosh, the only accused in the killing of Bangladeshi teenager Felani Khatun, citing him innocent. Following the verdict, the accused BSF jawan was released immediately. It was done and dusted. They had given their verdict. Justice had been served. Meanwhile, the silent tears of Felani’s family continued to flow. To those hoping for justice from Bangladesh, two facets of the above trial became clear immediately. One was that the BSF never intended to provide any justice. The courts were ultimately set to give a legal cover for the murder, which was initially marketed by the BSF itself as “a good guy shoots the bad guy” in a failed bid to lessen the brutality. To cool off tensions, sometime later the then interior minister of India, P.Chidambaram, came to Dhaka and promised that the BSF would never again under any circumstance ‘kill’ any unarmed civilian. It is sad that I have to repeat myself in saying that such promises have been broken, time and again, repeatedly, sans any remorse or fear of prosecution. The second facet of the above trial is more glaring and more within our grasp to question. What has the government of Bangladesh done to ensure the fair trial of Felani? Why has the government not pressured through relevant channels or even shown an iota of concern in this regard? It shall be ironic when we remind ourselves that the ones who spoke so much about justice for Felani are the ones who are victims of some of the most oppressive clampdowns during the tenure of the present government. Yes, it shall be wise that we remember that Mr. Adilur Rahman Khan, one of the most vocal critics fighting for justice for Felani, has been languishing in prison without a proper trial for more than three weeks now. His fault was being critical of government actions, something he has been paying dearly for. The BSF killed Felani and denigrated her to subhuman depths. The government of Bangladesh failed Felani. We failed Felani. That brings me to a hard conclusion. The message is clear. This is a world of the survival of fittest. However heartless and irrational it may seem, the denigration of Felani has become a stamp of superiority for Indians. The judgment is proof that “Indians can”. The fact that the world cannot do a thing about the murder of Felani is proof of the true face of the geopolitical dynamics of the region. It is not India who should be the centre of complaint and attention of us Bangladeshis. It should be Bangladesh. It should be about how we elect and re-elect successive meek minded stooges for government posts. We should focus on our weak foreign policy, address our superficially idiotic divisions and stop complaining about how advanced the world has become. It was our own weak and inconsequential stand that killed Felani. Remember this, if you are stupid enough to expect justice from the one who just clubbed you on the head, all you deserve is another good clobbering. Yes Felani, I am guilty too. Let Felani’s sacrifice not go in vain. May the Almighty open our eyes and expand our hearts. May we live as free thinking citizens.